This morning we looked out our window and saw a boat on fire. The burning 45 ft sailboat was close to us, anchored between the mooring field and the shore, next to our dock at Sunset Bay Marina. We didn’t hear the initial explosion because we had the air conditioning and TV on and all the hatches, the door and windows were shut. Apparently it wasn’t very loud but we were told flames immediately shot out of the boat. A family of four lived on Endless Summer in the Stuart area for at least several years and three of them were onboard at the time of the explosion. The fourth, their 13 year old daughter, was at church with a family friend. Sadly, their 11 year old autistic son died on the boat. Our friend, whose boat is in the mooring field and was one of the first to see the fire, rushed over in her dinghy and tried to help them escape their boat but the parents couldn’t get through the flames to save their son and at first refused to leave. A Stuart policeman in our dockmaster’s boat brought the parents ashore and they were taken to the hospital. 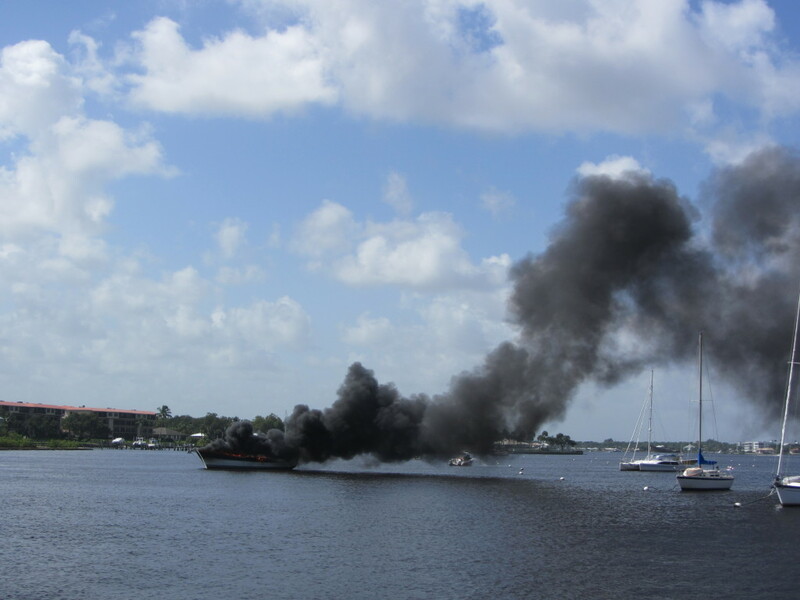 All this happened in minutes and was going on while we didn’t know the boat so close to us was on fire. The initial cause of the fire is not known. After everyone was off the boat there were several explosions, most likely when the fire reached the fuel and propane tanks. 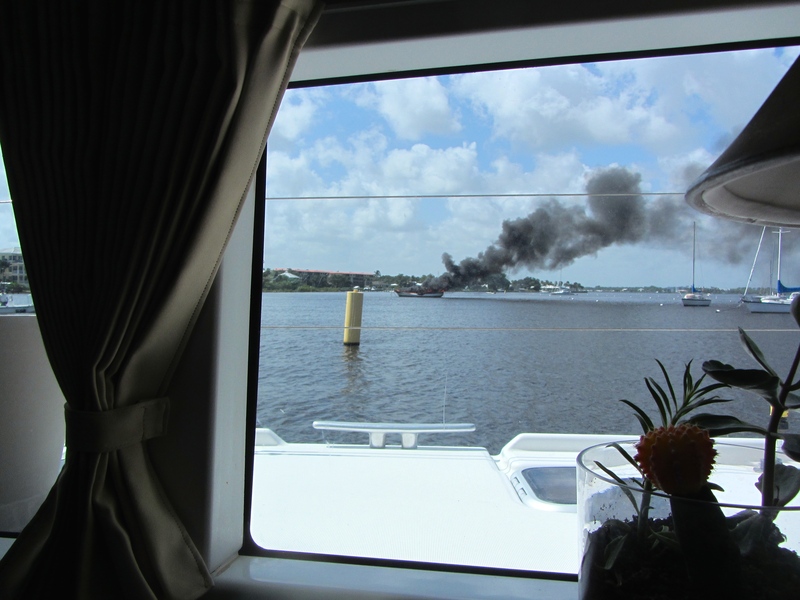 The toxic fumes floated over the mooring field while the fire continued to burn. The mast fell into the water and was temporarily holding the boat in place but then the boat started to drift. Most boats in the mooring field were empty although we did see the catamaran nearest the burning boat move away from the fire. 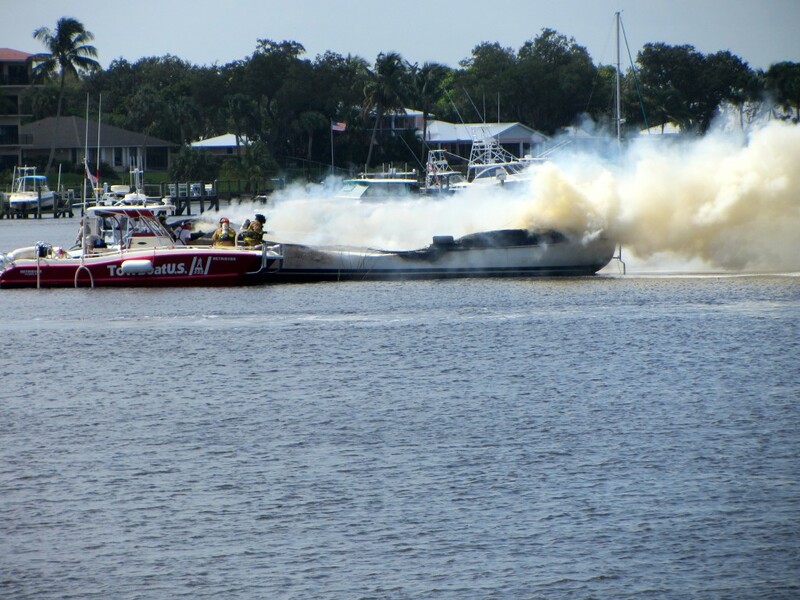 When we first saw the fire after the people were already taken ashore, we were surprised that a fire boat was not there extinguishing the fire. (Obviously there isn’t one in this area.) Soon a Tow Boat US boat came and they were able to get the boat away from the mooring field by attaching a line to it. The anchor did not seem to be holding Endless Summer. The wind direction and current this morning kept it from floating toward our dock. Eventually, probably after they were sure the explosions had stopped, the tow boat operators used a small hose which didn’t seem to help much. Finally, after the boat had been burning about an hour, the local fire department brought a long hose from their truck on the shore via a small boat out to the tow boat and put out the fire. 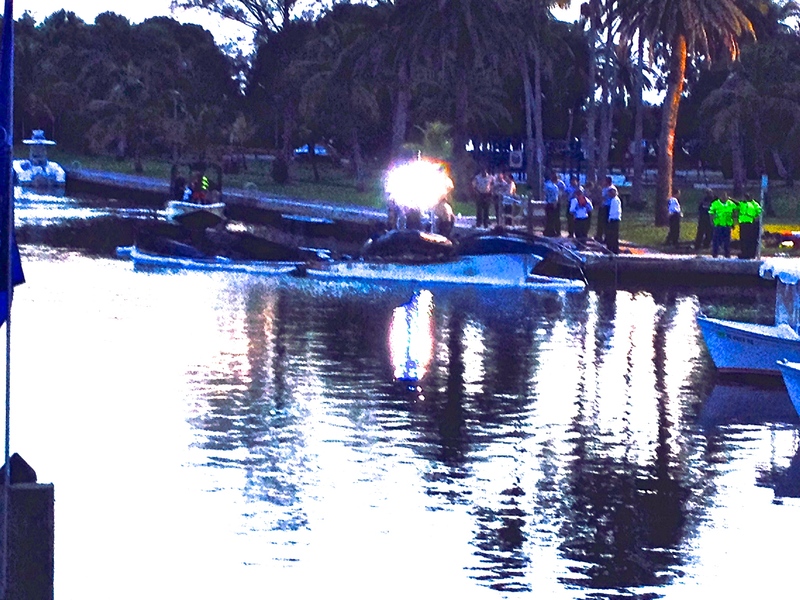 In the photo below you can see the firemen aboard the inflatable tow boat. When there were no more flames, what was left of Endless Summer Endless SummerEwas towed to nearby Shepherd Park. So sad for the family who lived aboard and lost their home, but the worst part of course was losing their son and brother in such a tragic way. Our friend said there was nothing anyone could have done either to put out the fire or to save the young boy. A pet parrot also perished in the fire. They were fortunate that further explosions did not happen while the parents were trying to save their son. We haven’t heard if they suffered burns, but the parents were taken to the hospital for at least smoke inhalation. Later in the afternoon the police had closed down nearby Shepherd Park where they had towed Endless Summer to a dock. There was little left of the boat above water. Until early Sunday morning the newspaper and local TV stations were reporting that they couldn’t confirm there was a third person aboard. We found it odd that they wouldn’t accept the parents’ statement that their son was aboard and that they couldn’t rescue him. By Sunday they finally reported his death. 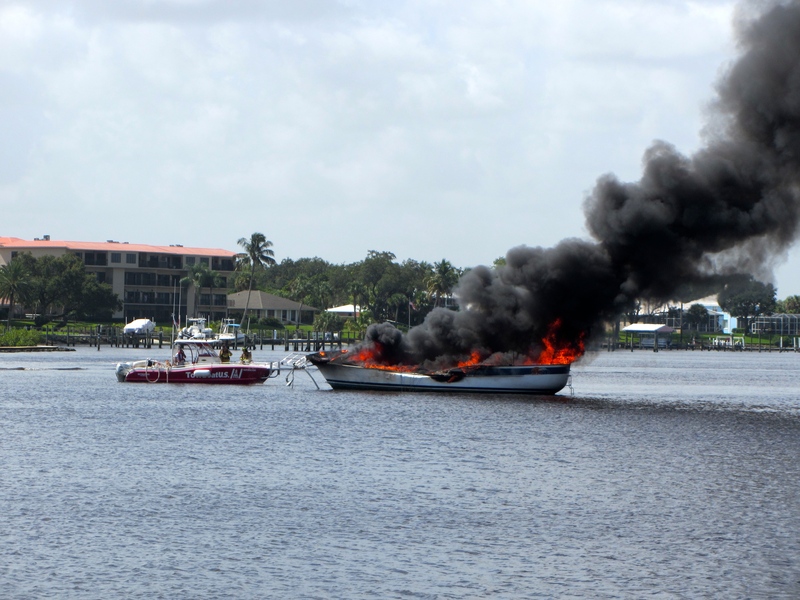 The boat was then taken to a yard in Ft. Pierce. On Seas the Day our propane tanks are kept outside in a locker in the cockpit and are turned on and off when needed from a control panel in the salon. 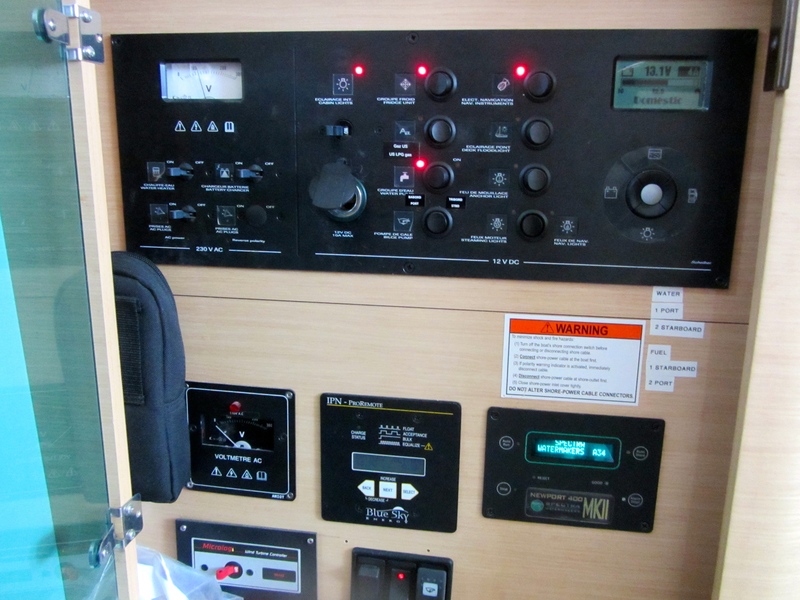 The stove, oven, and outside grill cannot be lit until the propane is turned on from the control panel switch and then a lighter is used to ignite the flame. Even with these precautions, in case of a fire on the boat the flames could eventually reach the tanks and explode as happened on Endless Summer. If we are off the boat for more than a few hours we completely disconnect the propane tanks. 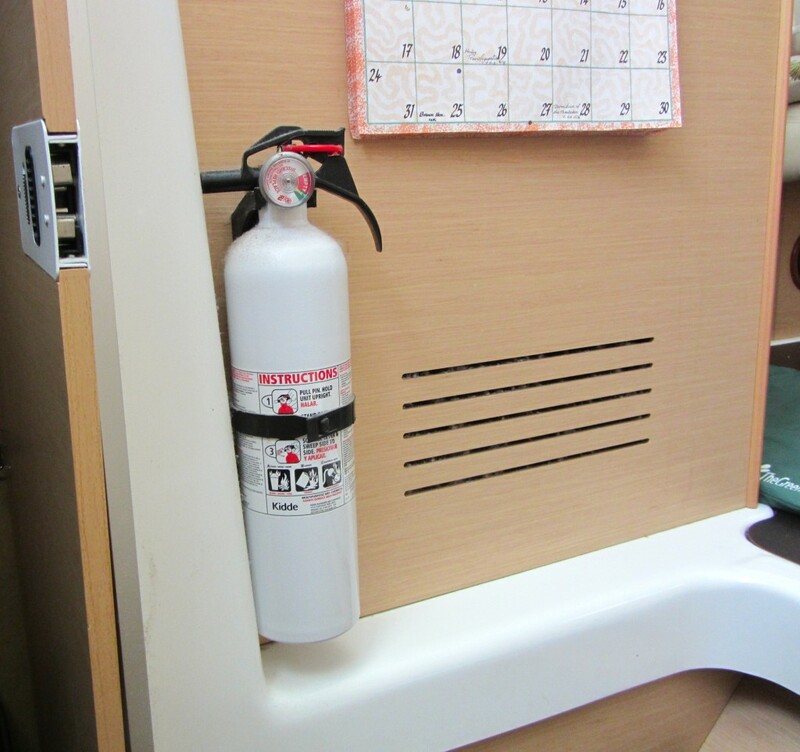 We have fire extinguishers in every room on the boat, as required by the Coast Guard, but the owners of Endless SummerEndless Summer tried to use theirs and they couldn’t put out the massive fire. At all marinas, there are fire extinguishers on the docks and if a boat catches fire, nearby boats would be released to float or be towed away from the dock. 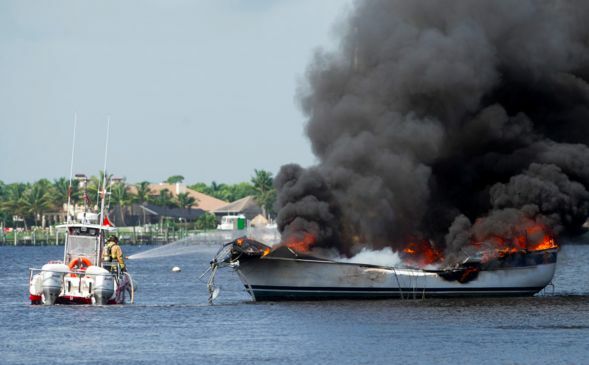 Most people probably think that what owners fear most is their boat sinking or someone falling off a boat in rough weather but fire is definitely the most dangerous thing that can happen. This entry was posted in Living on a Boat, Sunset Bay Marina and tagged Propane on August 31, 2014 by Jan.